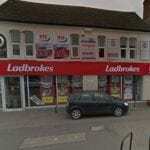 Here you can find local information about the Ladbrokes bookmaker located at 339 Lincoln Road in Peterborough. We have details of the opening times, current offers and a map showing where the shop is located. 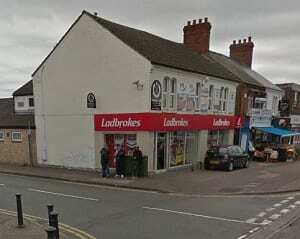 Below is a map showing the location of the Ladbrokes betting shop on Lincoln Road in Peterborough. If you are in this area and want to place a bet, this shows you how to find it pretty easily. 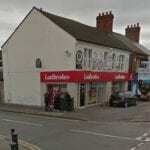 Below are some photos of the shop which is on a high street close to many other local businesses, restaurants and shops. Here is a full list of opening times for this betting shop so you can plan your visit around when it suits you. 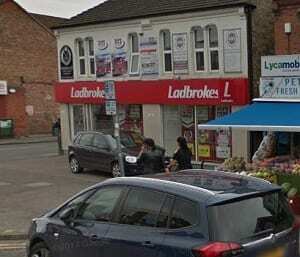 Also check out this page to see a list of UK Ladbrokes shops. 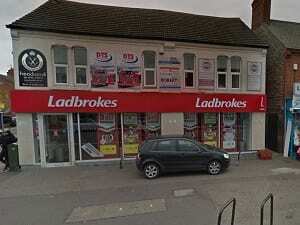 Lots of people like visiting their local bookmakers to bet on cricket or other sports and this is definitely a top brand to try out. 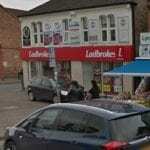 The Betting Shop is operated by Ladbrokes Betting & Gaming Limited (#1611) trading as Ladbrokes, based at Ladbrokes Ltd, Imperial House, Imperial Drive, HARROW HA2 7JW. The license status: Grant by Peterborough City Council as at 27/01/2011. T&Cs 18+. New customers only. Certain countries only. GBP, EUR & SKR only. Min deposit and spend £10 on Bingo within 7 days of reg. Bonus for Bingo only. 2x wagering req apply. Bonus valid for 7 days. T&Cs apply, see below. T&Cs 18+. New Customers Only. Min £20 deposit. Max bonus £500. 20x (deposit + bonus) wagering reqs apply. Contributions to wagering reqs vary by game. Bonus valid for 30 days (bonus + winnings removed). Certain games and payment methods excluded. Bets covering 67% or more of Roulette table don’t count to wagering. T&C's apply. Peterborough is a cathedral city in Cambridgeshire, England, with a population of 183,631 in 2011. Historically part of Northamptonshire, it is 75 miles (121 km) north of London, on the River Nene which flows into the North Sea 30 miles (48 km) to the north-east. The railway station is an important stop on the East Coast Main Line between London and Edinburgh. The city is also 70 miles (110 km) east of Birmingham, 38 miles (61 km) east of Leicester, 81 miles (130 km) south of Kingston upon Hull and 65 miles (105 km) west of Norwich. The local topography is flat and in some places lies below sea level, for example in the Fens that lie to the east of Peterborough. Human settlement in the area began before the Bronze Age, as can be seen at the Flag Fen archaeological site to the east of the current city centre, also with evidence of Roman occupation. The Anglo-Saxon period saw the establishment of a monastery, Medeshamstede, which later became Peterborough Cathedral. The population grew rapidly following the arrival of the railways in the 19th century, and Peterborough became an industrial centre, particularly noted for its brick manufacture. Following the Second World War, growth was limited until designation as a New Town in the 1960s. Housing and population are expanding and a £1 billion regeneration of the city centre and the immediately surrounding area is underway. In common with much of the United Kingdom, industrial employment has fallen, with a significant proportion of new jobs in financial services and distribution. Peterborough United Football Club, known as The Posh, has been the local football team since 1934. The ground is situated at London Road on the south bank of the River Nene. Peterborough United have a history of cup giant-killings. They set the record for the highest number of league goals (134, Terry Bly alone scoring 52) in the 1960-61 season, which was their first season in the Football League, in which they won the Fourth Division title. The club’s highest finish position to date was tenth place in Division One, then the second tier of English football, in the 1992-93 season. Irish property developer Darragh MacAnthony was appointed chairman in 2006 and is now owner, having undertaken a lengthy purchase from Barry Fry who remains director of football, having also been manager of the club from 1996 to 2005. Peterborough also has two non-league football teams. Peterborough Northern Star FC, play at Chestnut Avenue, Dogsthorpe and compete in the United Counties League. Peterborough Sports FC play at Lincoln Road and compete one division above Peterborough Northern Star in the Northern Premier League. As well as football, Peterborough has teams competing in rugby, cricket, hockey, ice hockey, rowing, athletics, American and Australian rules football. You can bet on all of these sports using online betting sites like Ladbrokes, or visit your local shop. Although Cambridgeshire is not a first-class cricket county, Northamptonshire staged some home matches in the city between 1906 and 1974. Peterborough Town Cricket Club and the City of Peterborough Hockey Club compete at their shared ground in Westwood.